This is a dish perfect for company, and pretty simple to make – the hardest thing about it is stuffing the chicken with the herby cheese mixture. But it’s well worth a few minutes of pain – it helps the drier breast meat stay moist and delish. The lovely sauce, made with the drippings and wine, takes just about three minutes to whip up while the chicken rests. And those grapes practically steal the show! Their sweetness is the perfect foil for the rich chicken and slightly tangy sauce. If you want to go all out like I did, serving with a little Risotto and a fresh salad (I used my Greek Dressing, olives, feta and tomato) makes for a gorgeous dinner. I put it all on the table for under six bucks when I last made this. 4 chicken breast halves, bone in, about 5 ounces each. Place the chicken breasts into an oven proof skillet. Loosen the skin carefully your fingers, from the bottom portion working upward, leaving the skin attached. Mix the feta with the basil and mash into a creamy paste. Add a bit of milk if it’s too dry or lumpy – if it’s not creamy it may poke through your chicken skin. Place a bit between two fingers and carefully work up under the breast skin, pulling your fingers out and leaving the cheese mixture behind. Rub each breast with olive oil and sprinkle generously with salt and pepper. Bake the breasts for 35 to 40 minutes, until just cooked through. With about 7 – 10 minutes left in the cooking time, nestle the grapes into the pan. Drizzle with a bit of the olive oil, season with salt and pepper and roast along with the chicken. (Watch the bottom of the pan during the cooking process – you don’t want any drippings to burn – add a bit of butter if necessary.) You want the grapes just slightly soft and barely wrinkled – remove them in the last few minutes of cooking time if your chicken takes a bit longer. 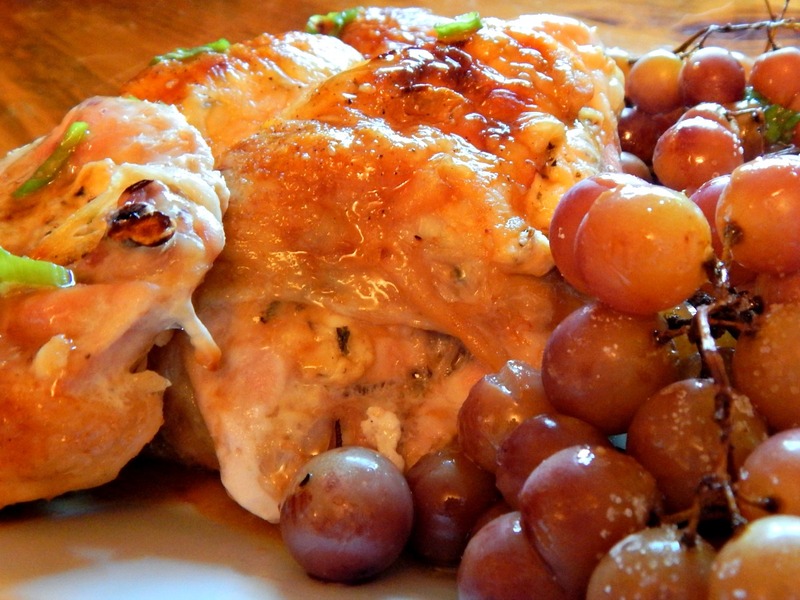 Remove the chicken and grapes from the pan, set on a plate and tent lightly to keep warm. Pour off any excess oil from the pan and deglaze pan with the wine, working any browned bits off the bottom – simmer until the wine is nearly gone. Add chicken stock and bring to a simmer (which should be almost immediately.) Turn off heat and whisk cold butter in a tablespoon at a time to slightly thicken sauce. Add in any juices accumulated on the plate the chicken was resting on. Season with salt and pepper to taste and spoon the sauce over the chicken when serving. Seriously, I wouldn’t change a thing about Roasted Chicken with Red Grapes, or the sides. Everyone loved it, and I can see this being a go to meal at our house. I think you could certainly change up the stuffing in the chicken breast with goat cheese, cream cheese, fontina, Asiago, ricotta and Parmesan or any herbs and spices you wish, but this works for us! This entry was posted in Click here for Bargain Meals, Click here for Fabulous Food Posts and tagged Bargain Meal of the Week, Cheese, Chicken, Easy Recipe, Feta, Frugal Hausfrau, Grapes, Risotto, Roast Chicken, Salad, Wine. Bookmark the permalink.